The letter S on this lighter and faster model of the Soviet KV-1 heavy tank could be said to stand for the 'sports' model because of its much improved top speed. The letter S stood for the Russian word 'Skorostnoy' which in English means fast. 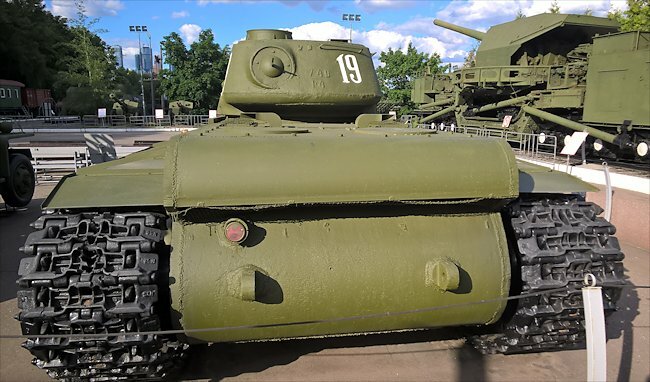 This KV-1S tank is being restored at the State Museum of the Great Patriotic War Museum 1941 - 1945, Park Pobedy, Moscow, using an original KV-1S turret and some KV-1 hull parts, the front section and some rear plates. The middle section of the hull is made of new material. The suspension comes from IS-2 and IS-3 tanks. The first 100 KV-1S produced had a KV-1 hull, so this configuration existed during wartime. It had thinner protective armour to enable the tank to have a higher top speed. It was produced in late 1942 with a new, smaller, cast turret and redesigned rear hull. 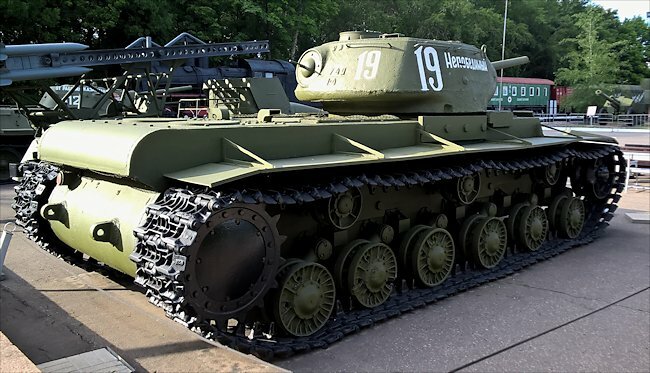 A sophisticated planetary transmission gearbox, that significantly increased the reliability, and allowed use of more efficient regenerative geared steering were fitted to the KV-1S. A total of 1370 were manufactured. The German Army’s response to meeting the very effective KV-1 and T34/76 soviet tanks for the first time in 1941 in battle was to quickly up-armour all their armoured fighting vehicles and fit more effective guns. The Soviets also increased the thickness of the armour on the KV-1 tank to help protect the crew from the new German 75mm guns that were replacing the 50mm tank guns. The problem was that the KV-1’s engine was not upgraded at the same time. This meant that the tank’s top speed was decreased as it tried to cope with the additional weight of the already heavy tank. 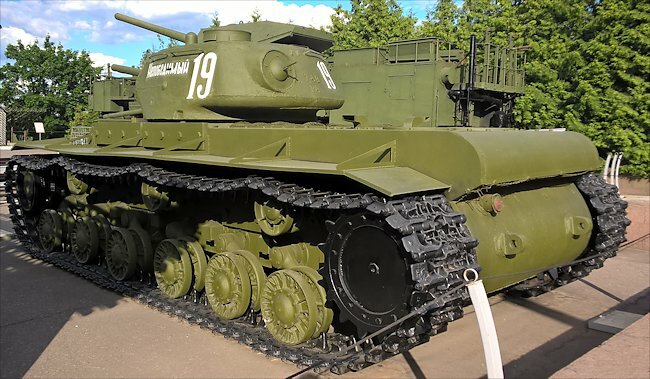 This tank was known as the KV-1 model 1942. Russian tank crews complained about the slow speed and the lack of manouvrability. They liked the added protection but not at the expense of being able to react fast in battle conditions. The T34/76 and KV-1 tank had the same gun. The decrease in mobility was not compensated in an increase in firepower. They made their feelings known to their officers. These constructive criticisms were obviously taken seriously because the lighter KV-1S was mass produced and entered Soviet Army service. The decrease in the thickness of the armor used on the KV-1S tank raised questions as to why the tank was being produced at all. 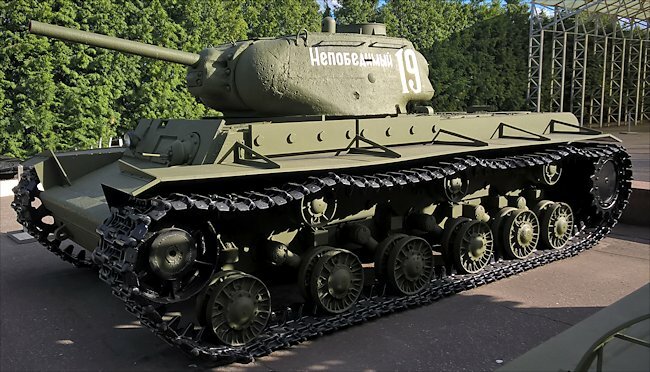 The T34/76 medium tank could do everything the KV-1S tank could do and it was a lot cheaper to manufacture. The weight of the KV-1S tank was reduced to increase mobility. The Soviet heavy tank program was close to cancellation in mid-1943 in favour of a fleet of medium tanks. What saved the program was the appearance of the German Panther and King Tiger tanks on the Eastern Front long with a number of other heavily armed and armoured tank destroyers. The KV-1S tank weighed only 42.5 tonnes compared with the 47 tonnes of the KV-1B model 1942 tank. It was armed with a 76.2 mm ZIS-5 anti-tank gun and three 7.62 mm DT machine guns. One of the machine guns was fitted in a ball mount on the front of the hull. Another was mounted in the turret next to the main gun and the third was fitted to the rear of the turret. A spare MG was often carried inside the tank. It was powered by a V-2 engine that produced 600 bhp. It had a top road speed of 40 km/h which was a drastic improvement over the top road speed of only 28 km/h of the KV-1B model 1942 tank. Its armour thickness ranged from 30 mm to 82 mm where as the KV-1B’s armour range was 20-130 mm thick. It required a 5 man tank crew to operate effectively; a commander, driver, gunner, loader and radio operator. Where can I see other KV-1S tanks?